Samuli Mansikka || Ranrapalca North Face, Cordillera Blanca, Peru. Aug 4th 2013. Ranrapalca North Face, Cordillera Blanca, Peru. Aug 4th 2013. Season has proved very difficult here in Peru’s Cordillera Blanca. We’ve had hard times with the weather and also come to notice that the routes we’d want to do have not been in condition for climbing. There’s been quite a few accidents here through out the season so we’ve been cautious selecting climbs. On Aug 3rd Phil, Pasang and I took a taxi (75 soles) from Huaraz to Pashpa at 3900 meters and trekked 3 hours to Ishinca basecamp (4350 m.). After a night at the rifugio we left at 2:30am for Ranrapalca (6162m.) and reached the foot of the North face at 6:30am. Climb itself was fun, although long and we got to enjoy one of few rather pleasant days weatherwise. Reached the top at 12am. Descended through Northeast face which proved to be quite an adventure due to crevasses, bergschrunds and penitentes. 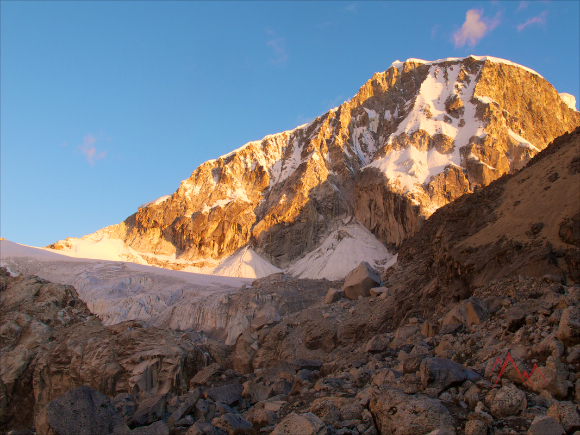 We eventually made it back to the refugio at 7pm and headed back to Huaraz the following morning.